At the dawn of the 1960s, a forty-three-year-old president and his thirty-one-year-old first lady - the youngest couple ever to occupy the White House - captivated the world with their easy elegance and their cool conviction that anything was possible. Jack and Jackie Kennedy gathered around them an intensely loyal and brilliant coterie of intellectuals, journalists, diplomats, jet-setters, and artists. Their three remarkable years at center stage transformed the politics and style of America. Sally Bedell Smith shows what it was really like to be inside the Kennedy White House. Drawing on interviews with scores of Kennedy intimates, including former lovers who have never spoken publicly before, and on private letters and personal papers, Smith sheds new light on the intricate relationships behind the high purpose and political drama of the twentieth century's most storied presidency. 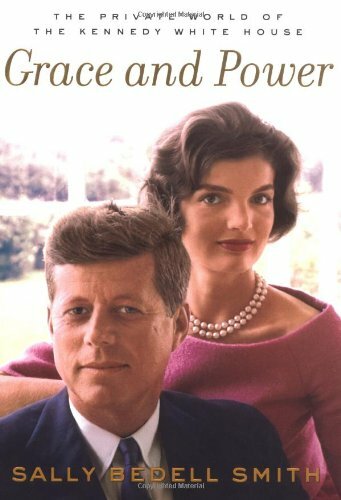 In GRACE & POWER: THE PRIVATE WORLD OF THE KENNEDY WHITE HOUSE, New York Times bestselling author Sally Bedell Smith takes us inside the Kennedy White House with unparalleled access and insight. Having interviewed scores of Kennedy intimates, including many who have never spoken before, and drawing on letters and personal papers made available for the first time, Smith paints a richly detailed picture of the personal relationships behind the high purpose and poiltical drama of the twentieth century's most storied presidency. In his public life, JFK created a New Frontier, stared down the Soviets, and devoted himself to his wife and children. As first lady, Jackie mesmerized foreign leaders and the American people with her style and sophistication, creating a White House renowned for its beauty and culture. Smith brilliantly recreates the glamorous pageant of the Kennedy years, as well as the daily texture of the Kennedys’ marriage, friendships, political associations, and, in Jack’s case, multiple love affairs. Smith’s striking revelations include new information about what drew Jack to his numerous mistresses – and what effects the relationships ultimately had on the women; about the rivalries and resentments among Kennedy’s advisers; and about the poignant days before and after Kennedy’s assassination. Smith has fashioned a vivid and nuanced portrait not only of two extraordinary individuals but of a new age that sprang to life around them. Shimmering with intelligence and detail, GRACE AND POWER is history at its finest.